The classic effect made famous by Michael Skinner, with an easy to do routine by Mark Elsdon. You not only get the old style gimmicked Ace of Hearts, but also the large format Phoenix Ace of Hearts! Give it a try! This effect is one of the alltime classic effects where nobody can follow where you place the Ace of Hearts, they will always be wrong. 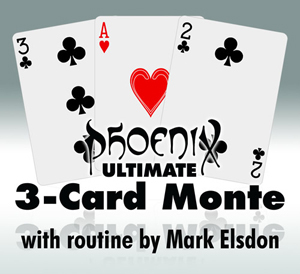 Fool yourself with this routine and these special printed cards in Phoenix card quality. The cards in this set have red backs. I've loved learning how to perform this trick, which requires just the three cards that are included. It features three seemingly impossible revelations, with the third and final one being the most powerful and surprising of them all. Google to find a video of Bill Malone's terrific performance of this routine to get an idea of its potential. There's a relatively low degree of difficulty, since no real sleight of hand is necessary. So it can be performed by a relative beginner, but you will need to practice the routine many times so that you can execute the moves smoothly, without revealing the secret, so it's best to do quite a bit of practice before performing this to anyone. For first-timers new to this effect, I'd strongly recommend getting a version that includes an instructional video giving tips how to best perform it, since you'll need clean moves and good presentation for best results. But it's well worth the effort, because the result can be quite mind-blowing, and there's good reason that this is a very popular effect with magicians, and one of the all-time most popular packet card tricks. It's also been marketed by Magic Makers under the name "Million Dollar Monte" or "Chase the Ace" but Skinner's "Ultimate 3 Card Monte" routine is the original and best. Available here are the three gaffed cards in the style of the popular Phoenix deck, which is a common alternative to Bicycle rider-backs.